This is the most important pre vintage job. Fruit is only borne on new growth so most of the previous year's growth needs to be removed. 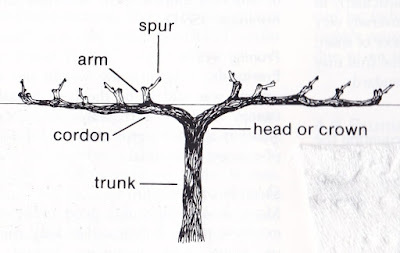 I have discussed the canopy management aspect and illustrated with pictures our pruning method a number of times on this blog. 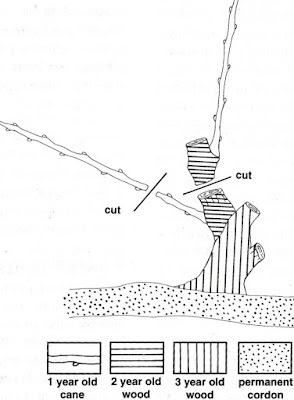 In summary we use the spur pruning technique on bi or uni lateral cordon trained vines as per the diagrams below. This job takes a few weeks but if the weather is nice (and winter around here can be) then it's a pleasant way to spend time. It's like working on a giant jigsaw puzzle making sure spurs are positioned and spaced correctly so it's just not mindless work. And it's a matter of taking the whole row into account rather than on a vine by vine basis. -Repairing Trellis Posts, Stays and Tightening Wires. A trellis is the structure that supports the grapevine framework. 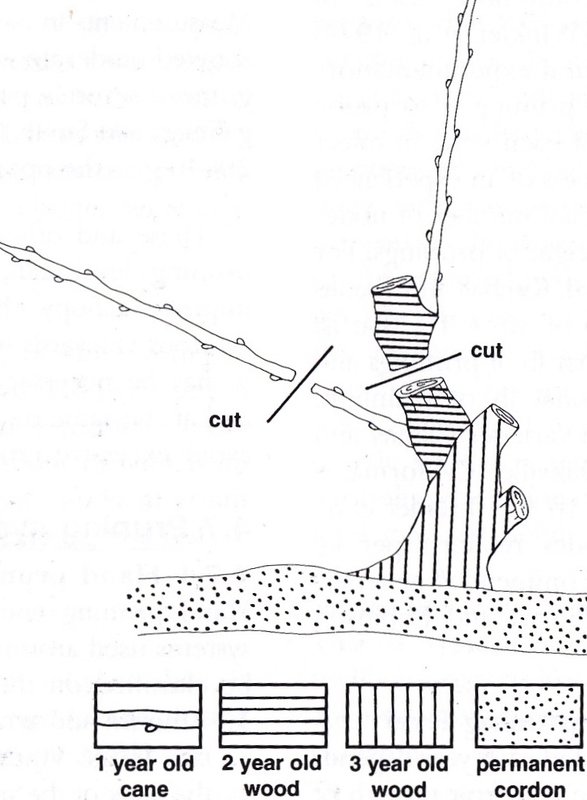 It consists of two end posts between which wires are tensioned. The tensioned wire is supported by intermediate posts down the row. There are many trellis designs. We use the simple 3 wire vertical shoot positioned (VSP) version. 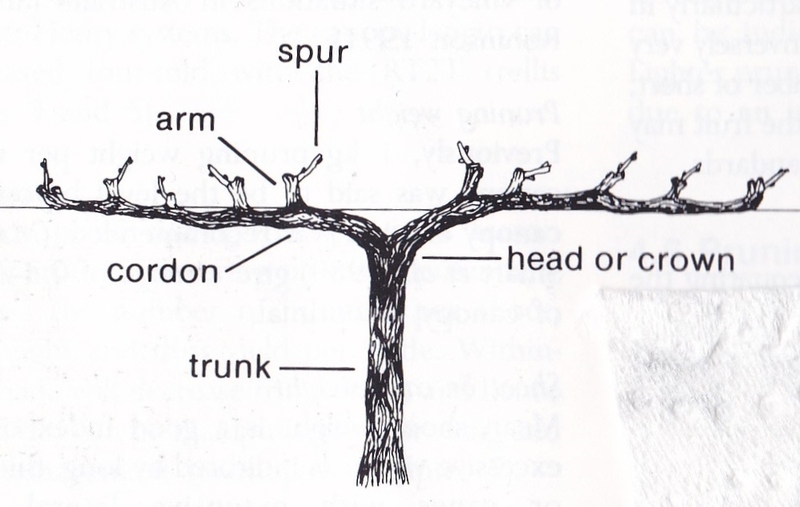 The loads that a trellis supports are vertical (the vine canopy), lateral, (wind blowing on the canopy) and longitudinal (wire tension). 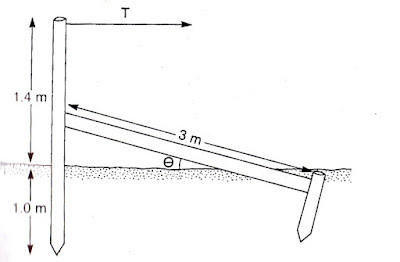 End posts are a major component of a trellis. There are many designs. 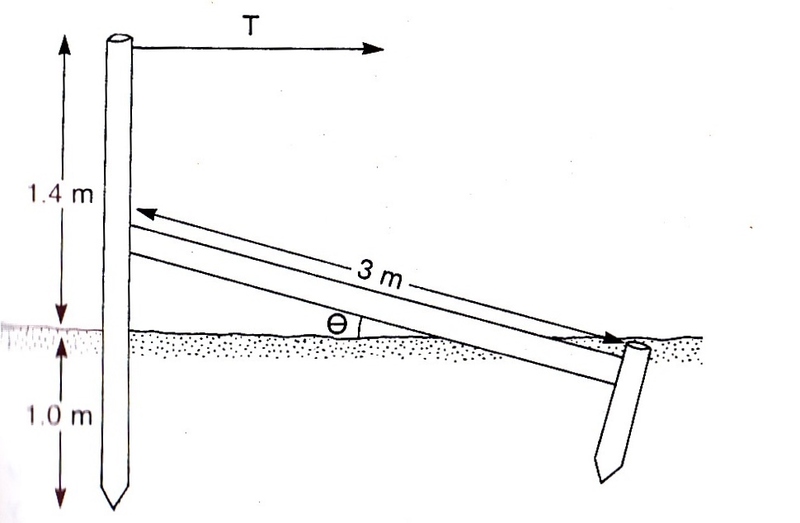 We use a modified version of the strutted strainer post below. Occasionally the strut will rot away and the strainer post leans forward causing an unacceptable loss of tension in the wires with resulting sag between the intermediate posts down the row. This means straightening the post and inserting a new strut and then retensioning the wire. Very rarely do we need to replace the entire structure but rot below the ground and the occasional white ant attack on posts will make that necessary. -Spraying Off Grass & Weeds in Under Row / Mowing Inter Rows. During the winter we let the grass grow across the vineyard block. In spring we mow the inter rows mainly for aesthetics but also to make working in the rows easier and making it easy to see our local black snakes that like hiding in longer grass. The under row is sprayed off with a herbicide eg. Roundup®. The growth here is mainly weeds and they can harbour all sorts of unwanted insects and can be a host of fungal diseases. They also are a 'user' of soil moisture during dry periods. The dead weed foliage contributes an increase of the organic matter in the rows. Soil organic matter (SOM) exerts numerous positive effects on the soil's physical and chemical properties. Preparing for Vintage 2016 / Part 2.